There's nothing quite like the panic, stress, and overdrive of a new school year to remind you that you're only human. New office, new job, familiar faces. These first weeks back were BUSY. I was so consistent with my speed work and workout schedule from March until July, but over the last two weeks, I've struggled. And once you give in to the struggle, it's hard to get back at it. Monday, on the drive home from Orlando after a rousing back-to-school conference, Elizabeth and I sketched out what this fall's workout schedule will look like. We have a 10k in October to train for, and I'm playing with the idea of running a half in December or January - I can't believe my "year of short distance" is almost over already! - so it's time to get serious again. 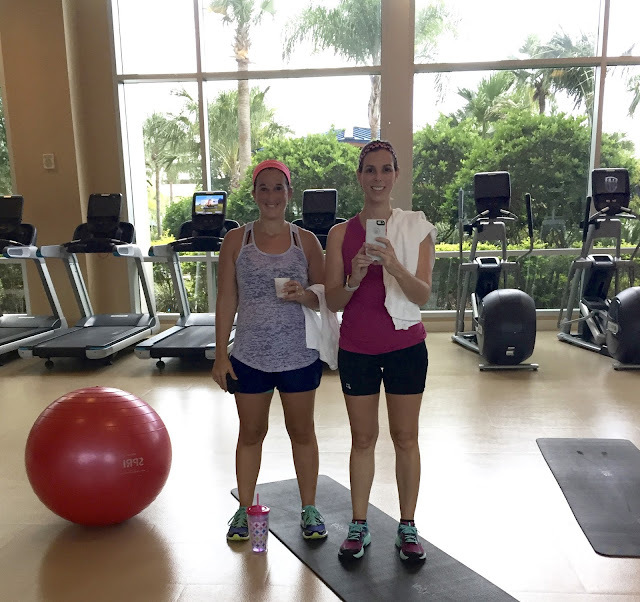 This week's workouts included two morning runs and one treadmill run (because we were traveling). I was impressed that we got up early to run before work this week! It's been storming so badly in the evenings that we really had to. We got up at 6am Sunday to run before we drove to Orlando; we were dressed and ready to go when we realized it was storming and there was tons of lightning. So we settled for treadmills later that day. We also did an ab workout Monday. Friday's easy run will be moderate distance, hence the +. Although summer is only going to get hotter and more humid in the next few weeks, we both know we have to get back into consistent training. I'm disappointed in myself for allowing myself to slack off a bit over the last couple weeks, and I'm worried that some of the major progress I've made with speed will have regressed a bit, but I really needed the time to adjust to being back at work. I'm also going to try to get back into my blog-reading schedule. I've missed catching up with all of you! Are you preparing for race season? 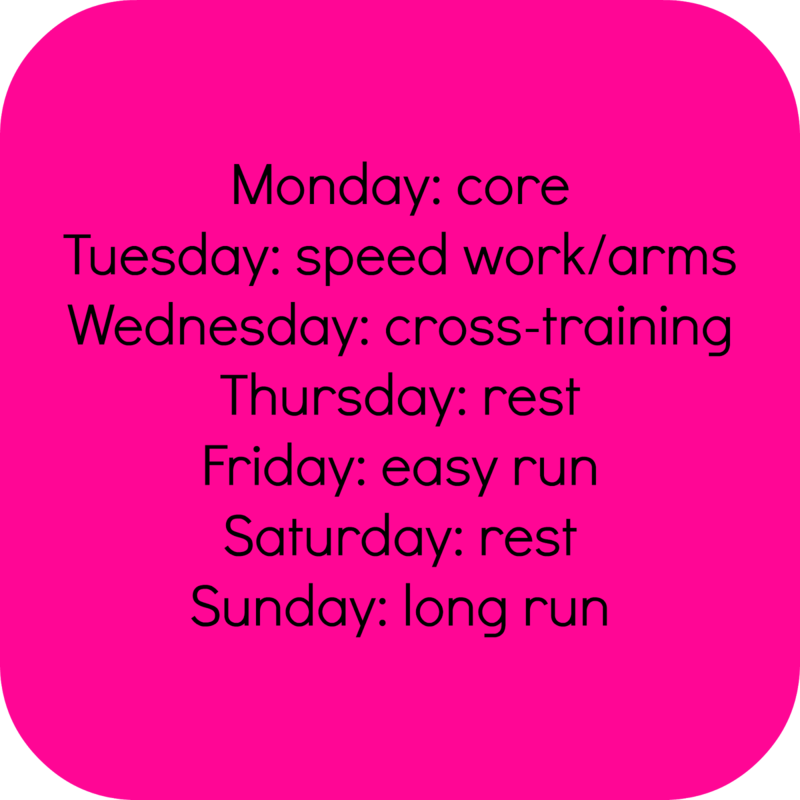 How do you balance running and cross-training? Hope the new job is going well. Did you change positions? I am jealous of your thunderstorms down there! I love some good thunder and lightening! Yes, I'm now a curriculum resource teacher. So I'm no longer in the classroom, but my job is to support our teachers, help with training, and get them their resources as best I can. I'm hoping I'll impact more students this way! It definitely helps to have a buddy to meet - I often sleep through morning workouts if I don't have an accountability partner. Welcome to Hit the Ground Running :) I'm glad you stopped by! Ah, balance. It's so hard to achieve. And just when I think I've got it, I'm not feeling well and having to take an extra rest day (at least). I think you need to be flexible, and let it go if it's not serving you that particular day. And don't forget that it doesn't have to be 30 minutes, or even 20 . . . something is always better than nothing. Yep, I feel like I fall into a good balance and then suddenly lose it, or get sick, or travel, or something throws me off. You're right. Something is better than nothing! Sometimes even five minutes is better than skipping a workout completely! If you've been consistently training for 4 months, two weeks is really not a big deal. People tend to seriously overestimate how much fitness they will lose in a given "off" period. But, I totally understand that falling out of a routine can just be frustrating in general. You've made so many gains this summer and you are going to run an insanely fast time in your 10K. You're so right that a week or two off after being very consistent isn't really a big deal. But it's so hard to get back into the routine, and it's frustrating to have to take a step back and build back up. I hate how hard it is to get back to things after I take a break. It's like I'm afraid that I forgot how to run. The Chicago Marathon is in 8 weeks, and I definitely don't feel ready. Race season is coming a little too quickly for me. You are definitely going to be ready for Chicago. Changing your training plan up may have you doubting, but I know you've got a strong base and consistent training under your belt. You're ready. It sounds like you've got a great plan ahead! And I agree with Hanna, I'm sure you'll still be in great shape despite a couple of weeks off. Can't wait to see how your training goes! Fingers crossed that I can pick up pretty much where I left off! I'm finding these days that the only way I can get any strength training in is if I keep it real short, like 10-15 minutes short. And sometimes even spread out across the day! Like weights in the morning and then planks when I get home. But something just about every day. New running goals on my calendar so new approaches to training. Going to try for a super speedy mile in November! But otherwise going LONG next year so laying the groundwork for that now. Yes, I think I'm looking forward to short cross-training/strength sessions on running days. It will feel more effective, I think. I'm excited to hear about your November mile goal! 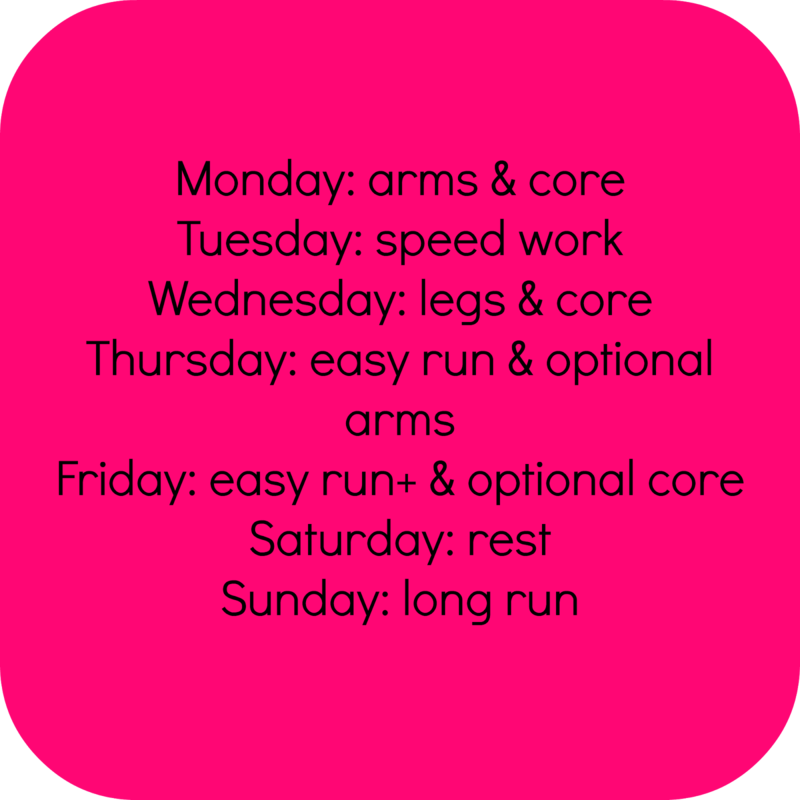 How do I balance running and cross-training? Not at all... haha. I am so bad at cross-training. And now that I've finished my half, I took a nice little break and am trying to decide what's next in terms of a workout schedule. Sigh. Decisions, decisions. I've always been bad at cross-training! I just don't find it very fun. It helps that my workout buddy likes mixing things up! Excited that you're starting 10k training! I'm also, selfishly, a little sad to see the year of short distances coming to an end. I definitely want to devote a segment to short distances next year. I'm a little sad too - I don't feel like I'm done yet, you know? I have four or five more months to dedicate to short distances, but I may decide to go into 2017 short, too, because I did a marathon in 2016 after saying I wouldn't! But I'm enjoying these shorter runs! I can't think about race season right now. There's still two months until Chicago but I wish there was three. Running six days a week during this training cycle hasn't bothered me at all, but I still don't feel ready to run 26.2. Maybe I will in another month (I hope so)! Next year I want to focus on shorter distances. I want to have a year like you did this year and focus on speed and strength so that the following year I feel better prepared to take on extra long distances. I feel like Hansons is going to be like a butterfly cocoon...one day you'll wake up and go "what happened?! Suddenly I'm in marathon shape!" I have faith that you'll be and feel ready! This year has been really fun and less stressful and daunting. I think I may stick with short distances for a bit longer! I too can't believe your year of small distances is almost over. What the hell?? :) Glad you guys have your new schedule all figured out! 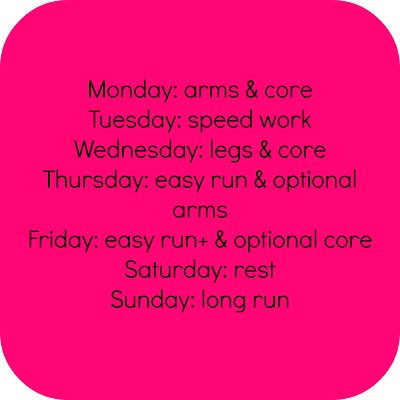 I am sticking with 4 days of running per week too. Maybe 5. We'll see how it goes. I don't feel like I've dug as deep and done as much as I wanted with this focus! I think I may add a few more months of short-focus in 2017. I've just been really enjoying it! I always find the start of a new job stressful and you need to settle into a routine with that before bringing all the other stuff back into it. Great job on setting a schedule for you guys to follow. I think setting a schedule is going to really help us adapt to the school year without the usual sluggish feeling that comes with it. I'm hoping it'll energize us!